We review the best bean to cup coffee machines available on the UK market today. Most people compare bean to cup coffee makers to espresso machines, and that’s not necessarily wrong. Basically, both of these coffee maker types do the same thing, only the former doesn’t require you to have any barista skills whatsoever. If you want to enjoy the refined taste of espressos, cappuccinos, and other exotic coffee types but don’t feel like getting a course in actual coffee making, we advise you to continue reading, as we’ve prepared a list of the best bean to cup coffee machines just for you. De’Longhi is, perhaps, one of the most important names in the cup making industry, and what contributes to this argument is the fact that they’ve been around for more than a century. They were founded in 1902 by Giuseppe and Fabio De’Longhi (hence the name) as a small manufacturing workshop for industry parts. Starting out with portable air conditioning machines and heaters, they soon expanded into the domestic appliances sphere where they excelled like no other at the time. The history of this brand is rich and colourful, and it’s safe to say that you simply can’t go wrong if you go with De’Longhi. De’Longhi’s “Magnifica” might just be the best bean to cup coffee maker by this brand. It features a stylish outlook outfitted with a 15-bar pressure pump. You can use it to brew coffee from fresh or ground beans, all with a simple click of the button. The frothing arm of the Magnifica is made of premium-quality stainless steel materials, boasting a high level of durability and reliability. Another notable feature is the built-in coffee bean burr grinder – it’s very easy to use it, and it allows you to grind your coffee beans at your leisure. The dual-boiler system comprised of two heating elements ensures absolute reliability at all times, but it also reduces the time needed to make your coffee. As for the brewing unit, it’s removable which means that it’s easy to wash and maintain. Other notable features include the active cup-warmer, and the adjustable-height dispenser. If you’re looking for quality, De’Longhi’s Magnifica is what you’re after. This remarkable bean to cup coffee maker promises quite a lot in terms of performance, and even though it does come supplied with a hefty amount of features, they’re all remarkably easy to use. Two-heating elements mean that your coffee will be ready in mere minutes, but it also gives us a solid reason to label the Magnifica as magnificently reliable. On top of that, this coffee brewer doesn’t cost a fortune. Sure, it’s not cheap per se, but it comes at a lower price when compared to other coffee makers of similar quality. Now, the first thing that we didn’t like about De’Longhi’s Magnifica is how noisy it was when it started working. This might not be too much of a problem for people who usually start the process and go elsewhere until it’s finished, but take note – the Magnifica produces a lot of sound while operational. That, however, is its only flaw. 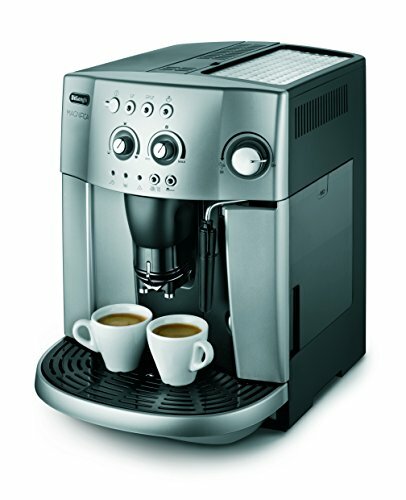 De’Longhi’s Magnifica belongs to the upper bracket of the “moderately expensive” price point category. It’s not the cheapest coffee maker in our review, but it’s certainly not the most expensive one either. Anyhow, it does provide a major bang for the buck and offers huge value for the price. Fast, reliable, noisy, but valuable. Those would be the words that would best describe the Magnifica. We liked it a lot, in fact, we adored the quality of features and the exquisiteness of the coffee we got from it, but the pleasure was somewhat diminished due to constant humming and buzzing sounds. Overall, we recommend it to anyone who wants only the best, as the Magnifica surely meets that criteria. Krups is a German brand that’s been around for even longer than De’Longhi. They started out in 1846, but it wasn’t until the 1950’s that they expanded into the home appliance arena. 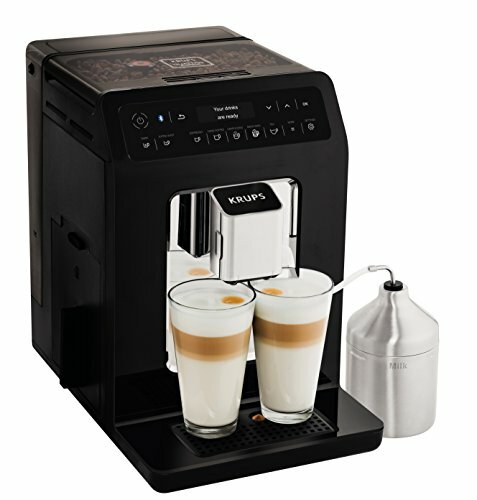 Krups were among the first brands to manufacture coffee maker machines, so it’s easy to see why they are doing so well even today. The “Evidence” is among the most elegant coffee makers we’ve come across. It sports a beautiful black outward appearance, although it comes in two other color variations as well (metal and chrome). The exterior looks very fashionable, and the machine itself is very compact. The Evidence is so small it’s easy to put anywhere, and won’t take up too much of your counter space. You’ll be able to make fifteen types of drinks with a single push of a button, including 7 types of black coffee, 5 types of white coffee (if you’re using Krups Cappuccino cups), and 3 temperature tea types. The Evidence is labelled as “customizable”, as you can add extra Espresso shots, make darker drinks, and make 2 cappuccinos simultaneously. Among other notable features there’s the OLED display & touch controls which give you direct access regarding your drinks. A compact coffee maker usually has the upper hand over bulky, unwieldy models. The Evidence is very small in design, making it perfect for kitchens of all sizes. What’s more, you can even take it on your trips and travels if you so desire. We also liked the variety of drink types the Evidence offers. There are fifteen types in total (7 black coffee, 5 white coffee, 3 tea types). Lastly, the completely user-friendly outlay of the features (OLED display, touch controls) make it very easy to use and simple to maintain, so even if you’ve had no experience with coffee makers, the Evidence will fit just right into your home. The only thing that’s not really perfect about the Krups Evidence is its price. Namely, it’s very, very expensive, featuring the highest price among the five best bean to coffee maker machines in our review. Nevertheless, it does precisely what it was meant to (and more), and it is actually superb value for the money, at the end of the day. Just like we’ve mentioned in the section above, the Krups Evidence doesn’t come cheap. Being in the lower bracket of the “highly expensive” price point category means that only a handful of people would even take it in consideration. Nevertheless, take into account all the benefits the Evidence brings to the table It’s very compact, fast, user-friendly, and it’s by far the most reliable coffee maker from a reliable brand. If you have the money, we encourage you to give it a shot and guarantee that you won’t be disappointed. Plainly put, the Evidence costs a lot, but performs better than any other “expensive” bean to cup coffee maker you’d find on the shelves of boutique-level coffee shops. Pricey, but valuable, the Evidence is worth the money. Just like Krups, Melitta is also a German brand. They were founded in 1908 in Minden by Melitta Bentz, a housewife who invented the first ever coffee filter. This brand has lot more to its name than the patent for the filters, as they improved and re-invented their technologies and craft over the century of their work. Firstly, Melitta’s Solo E957-101 comes in four colour variations: black, silver & black, silver, and black & silver (there are differences between black & silver and silver & black). It comes outfitted with a height adjustable coffee outlet, allowing you to make several types of coffee (for cups that are up to 5,3 inches long). One of the best technologies offered by Melitta’s Solo is the Aroma Extraction System which allows you to squeeze more “juices” from your beans. What’s more, auto-cleaning features are integrated into the coffee maker, along with descaling settings which makes the maintenance process a breeze. Not many coffee maker machines can boast about their user-friendly approach, but Melitta’s Solo can. The brewing unit is removable, the features easy to use, and all you have to do is just select your desired coffee type and press the button. You can use the Melitta Companion application to get the best tips & tricks about how to make the best coffee possible. Cleaning coffee makers can be a messy job, and we really liked the fact that maintaining the Melitta Solo isn’t hard at all. Knowing that Melitta literally invented the coffee filters, it’s no surprise that the brand uses special ones (complemented with similar technologies) to make the maintenance process as easy as possible (auto-cleaning/descaling). Even though the maintenance process of the Melitta Solo is fairly easy, the bad thing is that it requires checking too often. The level of water dispensation is quite high, which means that your tray will be often be drenched and soaked. Apart from that, the milk steamer is quite weak, indeed it is quite slow. Melitta’s Solo is among our more affordable picks. It belongs to the medium bracket of the “moderately affordable” price point category and packs quite a punch for the money. The Melitta Solo E957-101 is pretty great overall. Easy maintenance, reliable features, and a convenient app that will show you valuable tips and tricks are more than enough for us to conclude that this bean to cup coffee maker is well worth the money. This is a great option if you’re on a more limited budget. Gaggia is a relatively young coffee brewing brand which was founded in 1947 by Achille Gaggia. The contribution of this brand can be seen through their invention of the first steamless coffee maker. Although the patent was filed in 1938, it was not until 10 years later that Gaggia appeared on the scene. 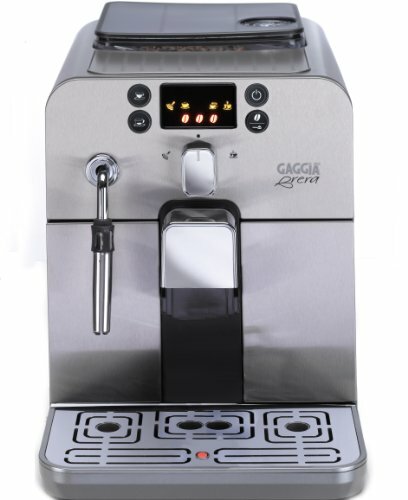 Gaggia’s Brera features a stainless steel panel, numerous customization options, and a ceramic burr-grinder. The customization options include water quantity, grinding strength, as well as grinding coarseness, allowing you to tailor your coffee’s taste as you see fit. The built-in burr grinder retains most of the bean’s aroma, ensuring that you get nothing short of perfect quality coffee. There’s also an energy-efficient mode (labelled as “standby”) which will automatically activate when you’re not using your Brera, consuming as little as a single watt per hour. The appearance of Gaggia’s Brera is attractive, but what we really liked about it was its durability. Even though it doesn’t feature a full-steel design, the plastic sides won’t give in unless you really neglect them. On top of that, the basic features perform exceptionally well for the price. The Brera can handle beans, as well as ground coffee, and there’s even the option to brew double shots at the same time. Maintenance is required often, though the Brera’s rinse cycle will be able to take care of most of the job. First of all, Gaggia’s Brera is quite pricey. It basically does the same job as the Evidence or the Magnifica (with small exceptions) but costs more. Nevertheless, several features make it better in terms of both aesthetics and performance, so it still offers value for the money. Gaggia’s Brera is among the most expensive bean to cup coffee makers in our review. It belongs to the medium bracket of the “expensive” price point category, but there are numerous reasons why it’s worth the cash. Even though it might not be as easy to clean as, let’s say, the Evidence, it comes with an easy-access tank, it allows you to easily dispose of coffee waste, and it’s as fast as it is reliable. The Gaggia Brera is stylish alright. It excels in aesthetics like no other coffee maker machine, and if looks are important to you, you should definitely consider it. While it costs quite a lot, its performance and the numerous benefits it brings to the table are more than enough for us to recommend it to you. Beko is the youngest coffee machine brand in our review. They are a Turkish company founded in 1969 by Vehbi Koc and Leon Bejerano. They mostly deal with kitchen appliances and domestic products, but their full range is comprised of laundry machines, refrigerators, air conditioners, TV sets, laptops, and computer-related electronics. Beko’s CEG7425 comes outfitted with a built-in burr grinder, can use grounded coffee and beans, and features a built-in milk frother. If you don’t want to spend hours on maintenance, the self-cleaning function will definitely appeal to you. The Beko looks stylish and fashionable, although there are other coffee making machines that are better in terms of durability. The controls are aplenty and fairly easy to use. We mainly liked two things about Beko’s CEG7425B. It’s inexpensive, and it’s simple. It comes outfitted with a basic set of features and settings (such as built-in burr grinder and milk frother) which perform on the same level as similar features of boutique-level coffee makers. On the other hand, the sheer inexpensiveness of the CEG7425B should appeal to those on a smaller budget. 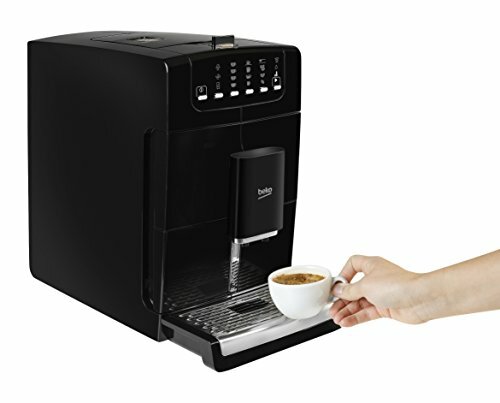 Most bean to cup coffee makers (of at least mediocre quality) cost way more, so if you wanted one and don’t have the cash for our other picks, Beko’s coffee maker is absolutely ideal for you. Just like there were two things we liked, there are also two downfalls of Beko’s CEG7425B. Firstly, it’s rather slow. Getting a cup of coffee will take some time. Also, whenever you use the “sleep” function the auto-clean process will begin. This is a smart feature, although some people are annoyed by it. Beko’s CEG7425B is the most affordable bean to cup coffee maker in our review, although it’s not that cheap per se. 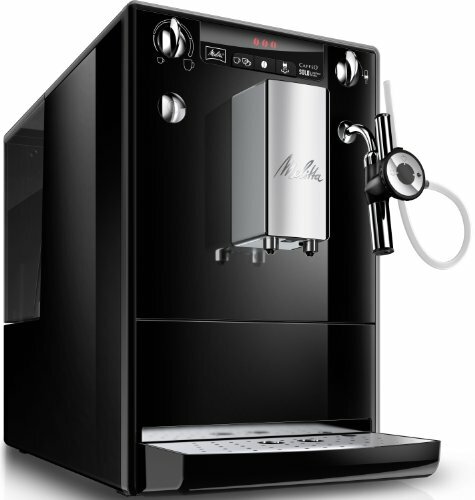 It belongs to the upper bracket of the “affordable” price point category and it’s best for people who are not very familiar with bean to cup machines but still want to try one out. Great for beginners, not so great for people with a refined taste for coffee. Essentially, Beko’s CEG7425B provides tasty cappuccinos and espressos, although you”ll need to be patient if you want them. Essentially, picking out the best bean to cup coffee machine shouldn’t be too hard. The market is brimming with new models every day, so finding the model that will best suit your purposes and needs has never been easier. However, there are certain things that might help you find the perfect coffee maker. First of all, there are famous, prominent leaders in this branch of industry which can be trusted even if you have no prior experience with them, such as De’Longhi, Beko, Krups, and Melitta. All of these brands have a long, rich history regarding their coffee making machines, and you simply can’t go wrong if you go with them. Secondly, note that there are huge differences in price between various bean to cup coffee makers. Some models are pretty okay while there are those that virtually cost an arm and a leg. The former deserve consideration if you’re on a low budget while the latter are practically reserved for people who don’t pay too much heed to price, demanding quality at all costs. Thirdly, make sure that your coffee maker isn’t too hard to maintain. The coffee making process can be really messy at times, and most people get dissuaded from making their coffee as often as they’d like if the machine drips too much and leaves too much mess behind. Most high-end coffee makers, though, are very easy to maintain, and some even feature self-cleaning functions. Lastly, versatility is a very important issue. Some coffee makers accept beans and ground coffee while others go as far as allowing you to choose between dozens of pre-built coffee type options. We hope that you liked our reviews of the best bean to cup coffee machines on the UK market today. We’ve deliberately picked the models from the world-class leaders in the industry, so all you have to do is kick back, relax, and take your pick.